A young man and his friends went to an organic family farm in order to buy pigs for a pig roast. Four of the guys bought piglets but the fifth guy did not. He was a 22-year-old. The farmer said, would you like this little runt because I can’t sell him. He said yes and took him not for the roast, but so that he could try to help him. He took him to his parents’ house and they didn’t know what to do with him. Mike went to meet him and was there talking to the husband. The wife was partially visible and was sitting in the truck. 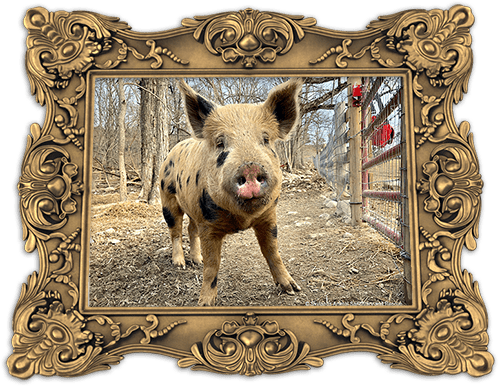 Mike was saying he would find the pig a home at possibly a different sanctuary when he approached the truck. The woman sitting inside had him wrapped in a baby blanket and he was so so cute that Mike just couldn’t give him up. He was just a little orange and black spotted beautiful little pig. Needless to say, Albert came home to Skylands Animal Sanctuary and Rescue for his new forever home!